Well I am so excited about my new scooter, just one drawback really, I am here in Portland and Francesca is still in Coffs Harbour- but as Granny always told me, good things come to those who wait. 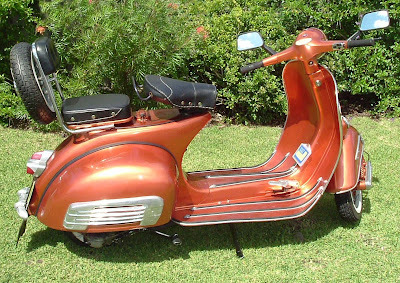 I have to credit a scooter mate of mine in Cairns for christening her Francesca, I had chosen Arabella as it meant 'answered prayer' but the new name suits better for a couple of reasons. 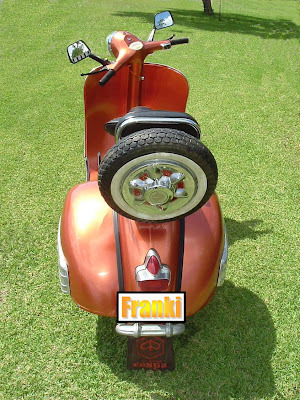 I emailed Marco to show off a pic and was telling him she is a bit of a 'Frankenscoot' in that she is customised and has many different parts on board and his suggestion of Francesca for a name kind of fits. Franki for short, which was the nicname of my beloved old 70's caravan that I recently sold. So it's Francesca and Lola.....so far! For the last month or so Portland Bay has been the home to this massive oil rig called "The Ocean Patriot"
They moored outside the bay when they first arrived and to see it out there it was awesome.. But then they moved it closer.. This thing is HUGE! It's apparently bought something like $40 million to the district with repairs, crew and family accomodation, supplies, contractor employment etc. If you are anywhere nearby and want to see something massive, make it quick- it's taking off soon I think. I am in desperate need of pulling my scooter off the road and changing the rear hub seal and both sets of brakes. She's not about to kill me or anything but I have the parts now and just can't seem to put her on blocks while the sun is shining. I am yet to take delivery of my new scooter so unlike some very lucky people I know in the scootering world, I don't have a spare! :( but I hope to change all that in about a month, I wonder if the new brakes can hold off til then? Hmmm? No-probably not. Bugger! I hate that feeling when the sun is out but the scooter is in! Oh well, been scooting everywhere to make sure I get lots of exposure before the need arises. Sunday I was up with the birds and set off on a lovely dawn scoot around the bay. Took some great pictures before deciding to go and have a coffee on the foreshore and watch the sunrise but just as I pulled around the corner to pull up the throttle cable snapped and I was all of a sudden stranded. I suddenly felt a huge relief when I realised I had some spare cables and all the tools I'd need in the glovey so I set about finding the problem. The cable had come away from it's barrel ended seal in the headset, easy enough to fix I thought- done it before. I pulled all the gear out of the glovey that was needed for the job and soon discovered I had every cable other than a throttle or clutch- which would have also worked in a pinch! Grrrr. It's 7.02am on a sunday, what to do? I luckily remembered my purse this time so caught a taxi home and grabbed the right cables and drove my van down the street to either fix it there or bring it home. The drama was over within about 8 minutes and I decided to leave my van there and just keep on scooting! So all in all it was a great day when I finally got going, picked my van up later in the day to pack it up for work and that was the end of another weekend. A New Years Resolution that I finally kept! This year I wanted to buy another scooter so I could always have one in running order when one is off the road. 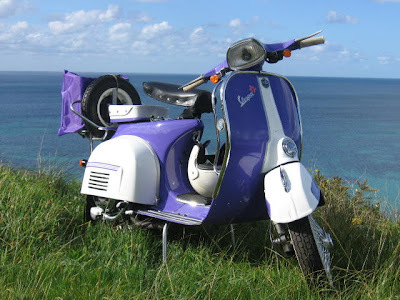 I had been watching a restored and customised vespa pop up for sale on and off online over the last 12 months or so and made an offer recently that was somewhat surprisingly accepted. So.......I am officially a scooter collector! She was listed as a 1966 Super but according to her numbers she's a '78 150 Super under all the customisation-but she's wider, longer, curvier and has all the wrong bling but nothing that can't be fixed as I have all the parts already in stock. Now.....where to find an old GS?